Tuesday, March 31 1908 -- Tonight, world-class featherweight boxer Abe Attell will experiment with going up to the lightweight class. He'll take on Battling Nelson, and the fight will end in a draw declared by stand-in referee Eddie Smith. Attell presumably was unhappy with either the outcome or the level of competition and decided to stick to the featherweight class from then on. The saga of Hen Berry's hat continues; another guest leaves the party, and mysterious guest #13 again fails to show up. Adam Chase strip #5, originally published July 3 1966. When George McManus made the jump from the Pulitzer organization to Hearst in 1912, he, like others who had trod the same path, took his most popular feature with him. The Newlyweds and their Baby, which had been running since 1906 in Pulitzer's World, was brought over to Hearst as Their Only Child. As with other successful features that jumped syndicates, the World kept the original name, and assigned a new cartoonist (Albert Carmichael) to continue it. Unlike other similar situations however, there seems to have been no litigation regarding the ownership of The Newlyweds. Perhaps by 1912 Pulitzer and Hearst had gone through the kabuki dance enough times that in the case of McManus' feature they couldn't be bothered to waste legal fees, since they had a pretty good idea of how things would work out. McManus, however, must have chafed over the fact that he was in weekly direct competition with another Newlyweds series. 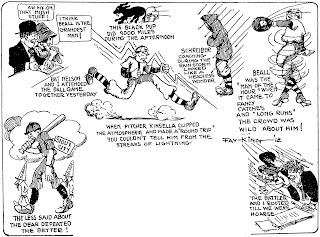 It certainly couldn't have helped matters that Albert Carmichael was a gifted cartoonist as well as an accomplished imitator of McManus -- one might even say he improved on McManus (in fact I did, at length). When McManus decided to drop Their Only Child in early 1916, one must wonder why he did it. Was he just tired of maintaining a series he had been working with a for a decade? Did the competition finally make him wave the white flag? Did the Hearst higher-ups make the decision for him? Was there some legal wrangling that ended the series? 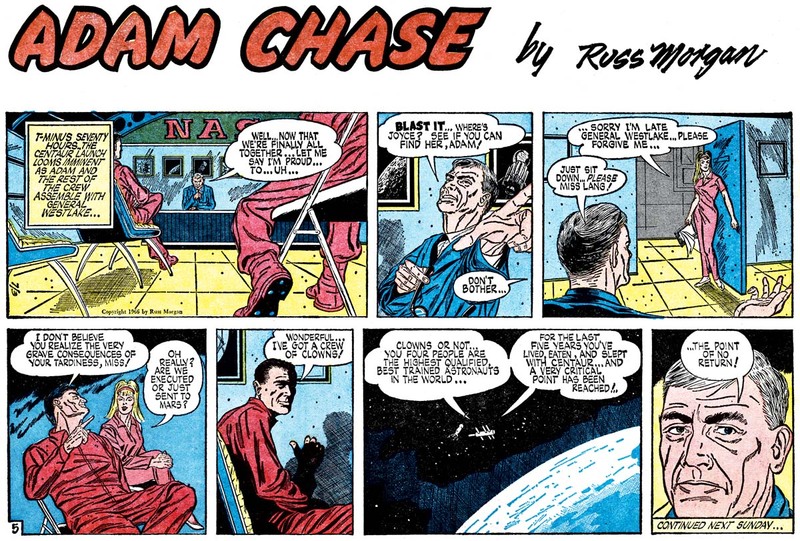 Or did he need the space for a great new strip idea? I can't speak to the other possibilities with any certainty, but I can say that the "great new strip idea"certainly wasn't the case. On February 13 1916, the week after his last Their Only Child strip ran in the Hearst papers, The Whole Blooming Family debuted, an effort of no great originality. The Whole Blooming Family brings us into the lives of a family of slightly repellant soft-headed idiots. Father is our protagonist, the only member of the family with any brains or wit, and he only looks good in comparison to the rest of his loser family. As domestic comedy it just didn't really have anything special to recommend it, and no characters were especially interesting or memorable. Thankfully, McManus sensed pretty quickly that he had a stinker on his hands, and the series was dropped after just eight months, on October 22, in favor of a new series, Rosie's Beau. Perhaps the only really interesting thing about The Whole Blooming Family is that it is tied, at least by title, to an earlier fad. Back around 1905-06, there was a spate of merchandise and recordings featuring The Whole Dam Family -- a film (note that the linked video is not the complete film), a record, many postcards (some with very nice cartoon art, though sadly none at this link are signed), and who knows what else. Obviously this is where McManus got his title, and perhaps more of the concept for the strip.The Whole Dam Family, a bit of wordplay in which references are made to the Dam father, the Dam housekeeper and so on, was somewhat risque in a day when even a "drat" said with too much venom could make some women faint dead away with horror. The gag, Cole Johnson tells me, is a lot older -- he can trace it back to 1883 at least (Atlanta Constitution, May 3 1883) -- but for some reason it really went viral in 1905-06. McManus certainly had this in mind with his title. One has to wonder if he tried to talk the Hearst folks into letting him use the name Dam, and was forced to settle for 'blooming', a total dud by comparison. Just for the record, a very obscure cartoonist working for a very obscure syndicate did resurrect The Whole Dam Family, complete with shocking name, a while later. But that's the subject for another day. Amazing to think that the word "dam" could have ever been remotely controversial. It's stories like these that make one grateful for the internet where cyanide and happiness - a comic regularly featuring light-hearted murders, kidnappings and probably some rapes - can survive free of controversy. Of course, someone has to go to the page specifically to see these comics and can blame only themselves for seeing them (not so when flipping through a paper). Fay really didn't have much art talent, and had little respect for anatomy lessons. She has a bit of trouble conveying expressions, and differentiating one scribbledy scarecrow from another (Was that one supposed to be that one's mother?) . Her basic shtick was this old maid naggy advice --don't argue over trivia, don't be jealous, don't use slang, keep your house clean -- but she would also make time-to-time comments on the news as well, usually some obvious finger-waving at a publicly embarrassed celebrity. Included with this batch of strips are some bathetic items which appeared at the time of the Lindbergh kidnapping. And I've heard people suggest T. E. Powers was the worst cartoonist? Maybe we're just all being chivalrous. I know several people personally who could draw better than this. Worse, I don't think that's a very surprising thing to hear. I chock this up to what youtube sensations are today: totally irrational, random, and, objectively speaking, undeserving of their acclaim and success, and yet vital to a vibrant unpretentious art scene. Not to get too philosophical, but it's stuff like this that makes you wonder about what art is all about, as well as question the value of merit (or lackthereof) that we attribute to artists. Fay Barbara King was born in Seattle, Washington in March 1889. Her full name was published in The San Francisco Call, January 24, 1913. According to the 1900 U.S. Federal Census, the King family was counted twice. The first enumeration was on June 1, 1900 and "Fay B. ", born May 1889, was the only child of John and Ella. They lived in Portland, Oregon at 323 Alder Street. Her father was in the baths trade. His business partner, John Compton, was the head of the household. The second enumeration was on June 6, 1900 and "Effie B. ", born March 1889, was the only child of John and Ella. They lived in Portland, Oregon at 590 Front Street. Her father was a Turkish bath employee. The Call, March 1, 1913, reported that Battling Nelson, King's husband, was planning to attend her March birthday. In Women and the Comics (1985), Trina Robbins wrote, "Fay King was born in Seattle to a trainer of athletes and grew up surrounded by sportsmen and pugilists…." "I thought perhaps you would like to see how some of the people who helped to entertain looked and how they were dressed, and I hope you will like and accept my sketches." Miss Angus was so much pleased with the little girl's thoughtfulness that she asked The Oregonian to reproduce some of the drawings. Besides those given here there were sketches of Mrs. Rose Bloch-Bauer, Mr. William Bernard, Dot Bernard, Mr. Baume and other, all of them being splendid likenesses. Miss King is a winsome girl of 14, whose great ambition is to be "a good, all-around artist—like Mr. Murphy." She has [illegible] had but one month's instruction in drawing, but her ability to reproduce likenesses is great, and with proper [illegible] she will have a future in the art world. "Oh, if I can just be like Mr. Murphy [illegible] will be entirely satisfied. I would [illegible] newspaper work, though. I'd rather [illegible] draw for people to admire my [illegible] vate. 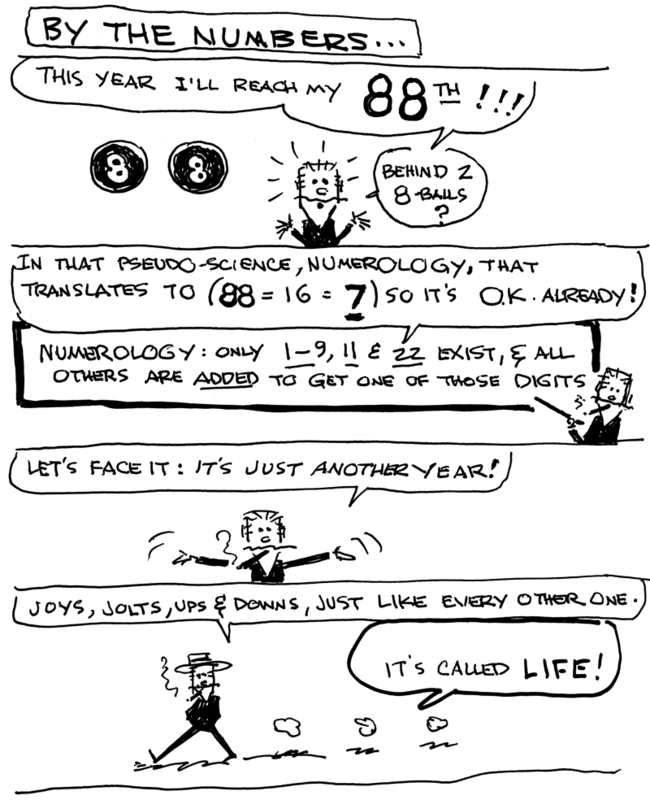 It's lots harder to [illegible] ing people than others, but I [illegible] want to be a cartoonist. If you [illegible] to put anything in the paper, [illegible] forget to say how much I think of Miss Angus—will you? I think she is [illegible] lovely, and everybody wishes she [illegible] get well." The 1910 census recorded the Kings in Portland at 826 Raleigh Street. She was an artist and cartoonist. Her education continued at Seattle University (SU). The Oregonian, July 2, 1911, published an article and photo of King in her new car, a gift from her father: "The latest recruit to the ranks of Portland's feminine motorists is Miss Fay King, the clever cartoonist and dramatic writer of the Spectator's staff…." The Spectator was the newspaper of SU. Her plan to travel in a hot air balloon was cancelled by her parents, as reported in the August 12, 1911, Oregonian. Young Woman's Parents Forbid Her Proposed Balloon Trip. Fay King, whose intention to make a balloon ascension with Tiny Broadwick was announced is not going to soar. Several important reasons have developed which make such a feat on the part of the young woman impossible. In the first place the advance story spoiled it all. It called the attention of the young artist's parents to the feat contemplated by their daughter, and both father and mother emphatically set their parental feet down and announced that no such action would be permitted. Miss Fay is an only daughter. Fay King is coming to Denver. Know her? Well, if you do not, you will mighty soon, for she is to join The Post staff on Saturday of this week. Fay King is the greatest woman cartoonist, caricaturist and "kidder" in the world today, and she's just bubbling over with fun of the most contagious, infectious kind. You'll laugh with her, for you just can't help yourself. Fay King is young—very young, in fact—but the hats of veterans in the comic art world are off to her. She comes to Denver from the Pacific northwest, where she had made a tremendous hit. She not only makes pictures, but she writes and writes well. She's a writer, a critic and a cartoonist in one, and good in each and every line. "Portland, Ore., April 14, '12. "Dr. Mr. Bonfils—Your telegram received. I bought my ticket today and will leave here Thursday (April 18) at 10 a.m., and will arrive in Denver Saturday (April 20) at 10 a.m.
"You are very kind to come to the depot and meet me. You don't know how much I will appreciate it. That you may know me I will be dressed like the inclosed sketch and will carry a Denver Post. And the sketch that she inclosed—well, just look at it and see if you can keep from laughing. 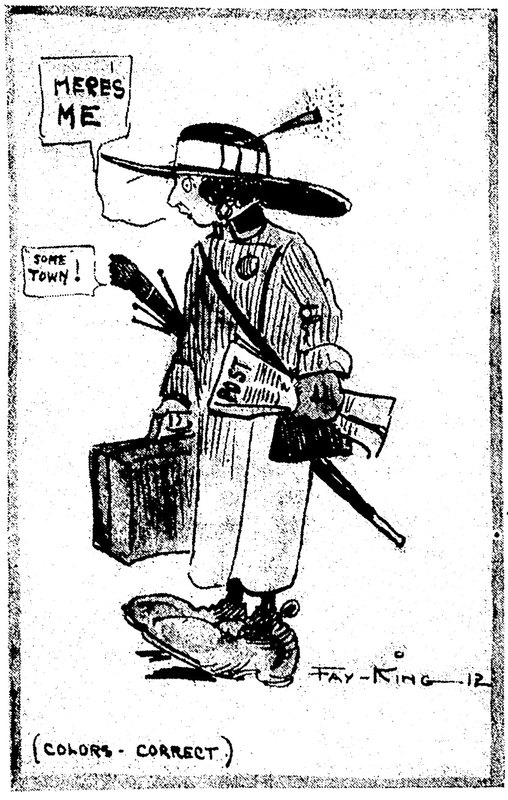 by herself for purposes of identification upon her arrival in Denver." ..."But—how about this latest rumor about your marriage to Miss Irma Kilgallen, the beautiful Chicago heiress? You admit you were sweet on her—won't you tell me all about it?" "Well, I think it was a case of love at first sight when Irma and I first met, seven years ago in Chicago, and it was mutual. Somehow we both looked forward to love in a cottage—but, then came her fateful trip to Europe, when she married that bum, 'Count No Account,' to please her mother…. ..."Do you think you'll ever marry, Bat?" I asked, remembering it was leap year. "Well, if I believed in dreams, I should say NOT—because the other night I dreamed (you see, this matrimonial publicity has been on my mind so), I was married, and presented my country with five young lightweights all at one time! I remember that I named them—Battling Jr., "T.R.," William Jennings Bryan, Julian Eltinge and Carter H. I was just opening congratulatory telegrams from all the dignitaries of the U.S.A., when I awoke. Do you wonder I hesitate to enter a (wedding) ring career after a jolt like that. Can you beat it." "Battling Nelson and Fay King Attend the Ball Game"
"Battling Nelson Becomes 'Kid' for a Day and Goes to Circus"
"…Oh, it all intoxicated us! We were in a whirl of pure joy every minute. When it was over—and Bat and I tired, tramped hand in hand, from the lot, we slowly came back from "kid land" to reality; but it was some trip, Steve, and it takes a circus to cast that spell." 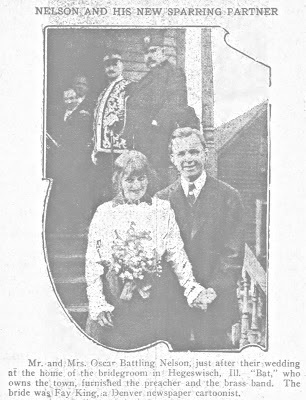 The Call covered, on August 5, 1912, their attempted marriage. Pikes Peak Summit, Colo., Aug 4. Battling Nelson and Fay King, a Denver newspaper artist, were balked here this afternoon in an attempt to get married. The former champion and Miss King took the trip of 14,147 feet up Pikes Peak for the start of their honeymoon. To their surprise and consternation they found out that the minister had grown tired waiting for them and had left. Only a telegraph operator and an undertaker were on hand. The undertaker was willing to be substituted, but Nelson decided to postpone the ceremony. Nelson and Miss King returned to Denver and Bat will there make arrangements for the wedding. After a trip to Chicago and Hegeswich he plans a honeymoon to Australia. 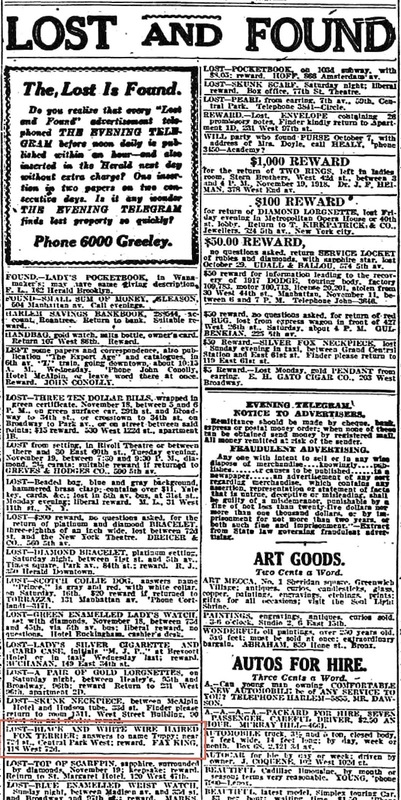 The Call published a follow-up article September 29, 1912. St. Joseph. Mo., Sept. 28.—For the first time in his life Battling Nelson has declined to be interviewed. This time the subject of the proposed interview was matrimonial, not pugilism. "Is it true that your rumored engagement with Miss Fay King of Denver is all off?" Nelson was asked. "The only match I know about is the one my Chicago representative is trying to clinch with Packey McFarland," replied Nelson, "and he is pretty slow about it, too." Miss King says she loves you like a brother, but that she has not considered you for a husband," Nelson was informed. "If McFarland thinks he can lick me, now is his chance," replied Bat. "Didn't you and Miss King go up on Pikes peak and engage a minister to marry you? And didn't the minister fail to show up?" were the next questions. "I'm not going to talk about marriage," said Bat. "I am leaving the matter up to her. What she says is right, no matter if she's wrong." Then Nelson got serious. "There's no use in my talking marriage," he said. "Any man who says he's going to marry a woman is crazy, unless he has her right at the altar—and even then he's liable to be fooled. She may not like the color of his necktie and call off the match. 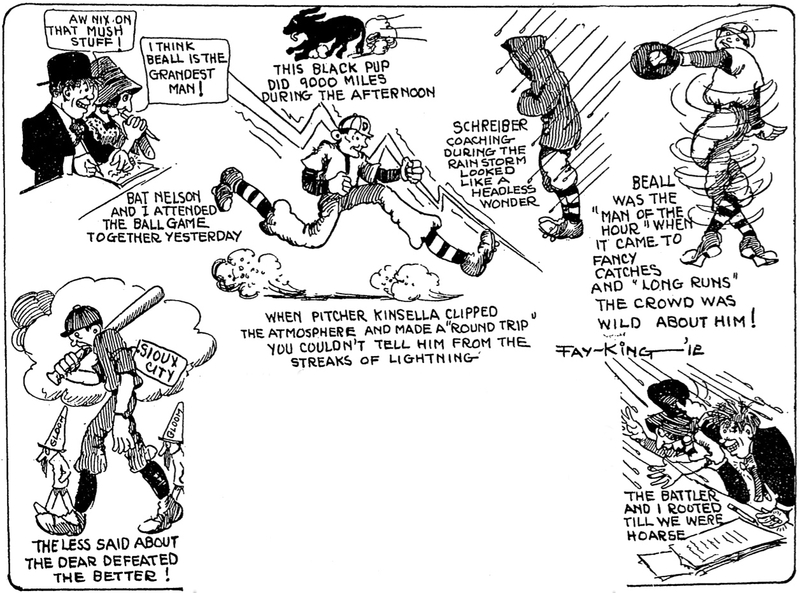 Miss King is a fine cartoonist, and she'd make a fine wife for anybody. If I'm the lucky fellow at the finish I'll be tickled to death, that's all. But I'm not saying a word one way or the other on the time, the place or the girl." The Denver Post, January 22, 1913, may have been the first paper to report their upcoming marriage. 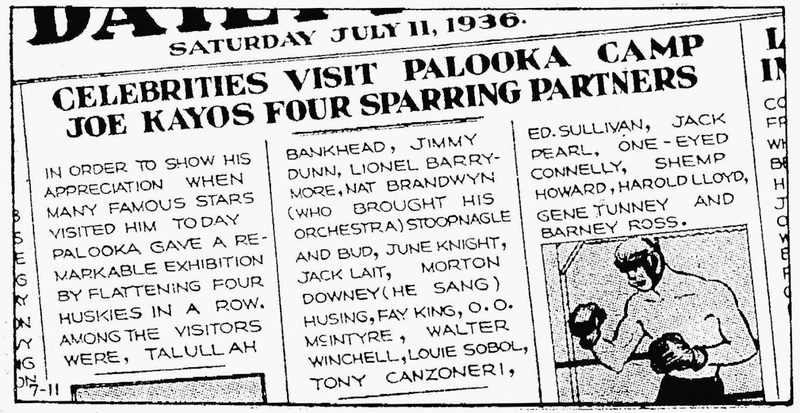 Fay King, the clever cartoonist and artist, who has been a member of The Post staff of artists for several months, and Battling Nelson, former lightweight pugilist champion, are to be married at Nelson's home in Hegewisch, Ill., tomorrow. They left Denver last night, informing only a few close friends of their departure. They will return to Denver the first of next week and may reside here. Personal friends of the couple have known for some time that Fay King and Battling Nelson were in love with each other. But there was no intimation on the part of either that an early marriage was contemplated. Miss King had not anticipated any such quick move on the part of her fiance, but after his arrival she decided with him that there wasn't any use in delaying the marriage, so she obtained a leave of absence and joined in with his plans. Nelson's winning of the clever artist, though it had its inception long ago, was really a matter of a four-days' campaign, conducted with whirlwind speed. The former champion arrived in the city on Monday, determined that when he left he would take Miss King along with him. He was not prepared for any long stay, and he wasted no time in completing his conquest, for on Tuesday evening the young artist had yielded to his forceful wooing and agreed to accompany him back to Illinois. They are on their way now and by Thursday night will have been married and have held their wedding reception in Hegewisch. The Call, January 24, 1913, published an account of wedding. Chicago, Jan. 23.—Oscar Matthew Nelson, once famed as the lightweight champion pugilist, and Miss Fay Barbara King, a Denver cartoonist, were married today at the fighter's home in Hegewisch. The ceremony was brief, but as the final words fell from the minister's lips the bride, overcome by the nervous strain, swayed and toppled over into her husband's arms, sobbing violently. "Bat" soothed his bride, and pretty soon she smiled and said, "I feel much better after my cry." Rev. W.E. Pearson, a Lutheran clergyman of Moline, performed the ceremony. "Jack" Robinson, manager of the fighter, was best man, and Miss Ida Nelson, sister of the groom, was maid of honor. Outside a brass band burst forth into "Moonlight Bay." A report said there was to be a double wedding. Miss Ida Nelson, it was said, was to have been married to a young man of the town immediately after her brother's marriage. The story run that at the last minute the young man, fearing bad luck if he married on the twenty-third, insisted upon a postponement. Miss Nelson denied the story. "She'll probably devote her time to illustrating my map. But I'll stay in the ring. I've got to, as that's the only way I have of making a living." The couple came to Chicago after the ceremony and a wedding breakfast was served at the Wellington hotel. The trip downtown to "Bat's" home was a gala affair. A special car on the Illinois Central was chartered and a band hired. On the train Miss King drew a cartoon of the pugilist. The moving picture men were clamoring for some pictures and set up their machines before, the happy pair. The band played and "Bat" leaned over and (kissed his bride to be twice, and the picture machines got it all. A big crowd turned out at Hegewisch to greet "Bat" and his fiancee. There were vigorous cheers as the party stepped from the train. The band played as the long line of friends, townsmen. newspaper men, moving picture operators and photographers started for the Nelson home behind the bridal party in a big automobile. Tonight the couple entertained friends at a theater. Denver, Feb. 28.—Battling Nelson, financier of Hegewiseh and erstwhile champion lightweight prize fighter, will be met with a summons in a suit for divorce when he arrives in Denver March 5. This announcement was made tonight by friends of Mrs. Nelson, better known in Denver as Fay King, a cartoonist on the Post. That she was kidnaped by Battling Nelson on the night of January 20 for her marriage three days later at the fighter's home will be the charge which the suit will be based. Fay King remained three days as Nelson's wife. She left for Denver on the Sunday night following the marriage and then went on to Portland. Ore., to visit her parents before resuming her work on the Post. "Nelson heard of my reported engagement to a Denver man and ho stopped his fighting engagements to come here for me." said Miss King tonight. "He took me by storm after I was weak and a nervous wreck from resisting him and his proposals he forced me into a taxicab and rushed me off to the station. "I realized that I had made a mistake the day of the wedding and the first opportunity I got I hurried back to Denver. I will go right on working on the Post as though the affair had never happened. "The marriage must not and will not stand." 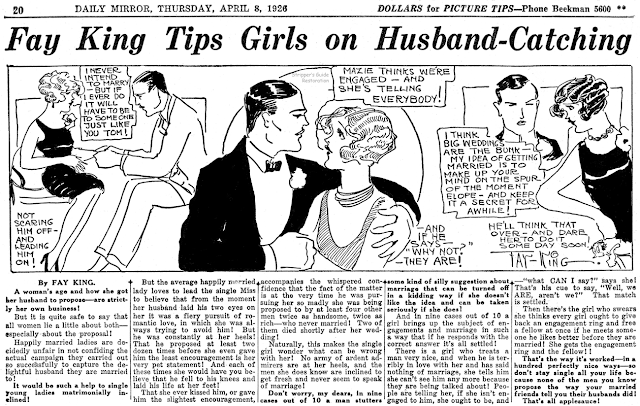 In The Call, May 6, 1913, the couple was back together. Chicago, May 5.—Battling Nelson, hero of many ring battles, the receiver of many a lacing, ''…and former lightweight champion of the world, today announced the date of his retirement from the ring. Bat is going to quit. There's no idle boast connected with the announcement. It may not be the wish of the once durable Dane to put the gloves on the shelf, but it is the request Mrs. Battling Nelson, Fay King, and Fay has the say. Labor day will be the Dane's last fight—this because it will be the eighteenth anniversary of his fighting career. He would quit now but for that. There will be no fights between now and September, however. Nelson and his wife are now in Bedford, Va., resting up. Bat plans on settling in the far west. Years later Nelson sued King for divorce as reported in Cartoons Magazine, March 1916. A divorce was granted later that year. The Colorado School of Mines Magazine, November 1914, published an account of King's visit. 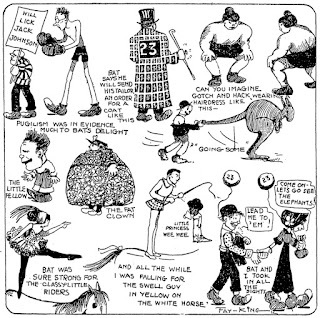 A 1917 issue of Motion Picture had two lines about King: "William S. Hart has recently been cleverly cartooned by Fay King, the famous Denver sketch-artist. She concluded a letter to him by averring: 'You get 'em—from the seminary to the cemetery!' 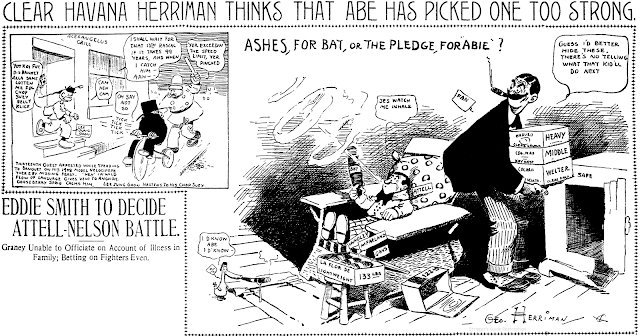 " Cartoons Magazine, January 1918, noted her move to the art staff of the San Francisco Examiner. Later that year she moved to New York City. In the 1920 census, she lived in Manhattan, New York City at the Pennsylvania Hotel, 425 Seventh Avenue. She gave her age as 26 (1894 birth year) and was a newspaper feature writer. 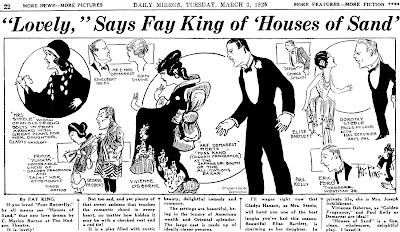 Editor & Publisher, January 29, 1921, noted her whereabouts: "Fay King, cartoonist and feature writer for the New York Evening Journal, just spent a week visiting "home folks" in Kansas City. Miss King was employed on the Kansas City Post and Denver Post before going to New York." Google News has a selection of her illustrated writings from the 1920s and 1930s; in the box "this exact phrase" enter "by Fay King", without quotes. 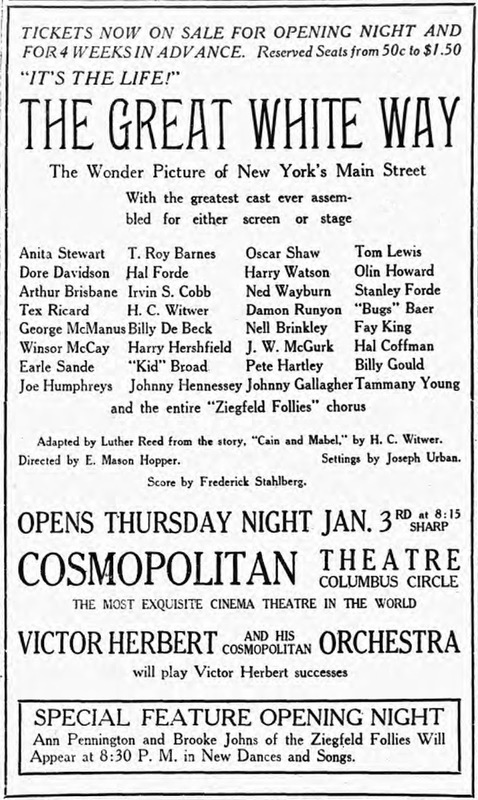 King wrote about her strip Girls Will Be Girls in the publication, Circulation, February 1925. In the book, Nell Brinkley and the New Woman in the Early 20th Century (2001), Trina Robbins talks about King's work. 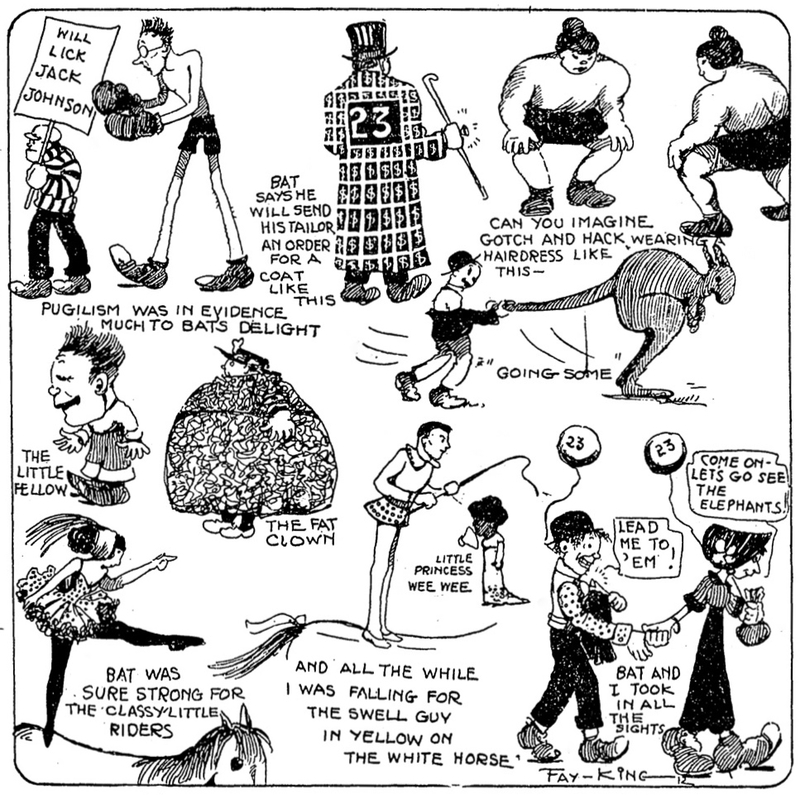 She was one of several cartoonists featured in an advertisement for the Federal School of Illustrating, which was published in Popular Mechanics, December 1928. In the 1930 census, her age was misrepresented as 35. She lived in Manhattan at the Commodore Hotel, 109 East 42nd Street. Her occupation was journalist and cartoonist. In O.O. 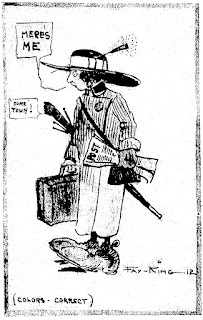 McIntyre's column, "New York Day by Day", in the Reno Evening Gazette, October 25, 1934, it said: "Fay King is, so far as I know, America's only lady newspaper cartoonist. And the most pronounced recluse among the limners. Vivacious and sparkling, she is sought wherever crowds gather but rarely responds. I have yet to see her at any of the whirligigs of literary folk. She resides at a sedate midtown hotel, is an indefatigable walker, devoted to a canary and a frequent loiterer in the galleries. But is—and that's unusual for a Manhattan celebrity—a strictly no-party girl." 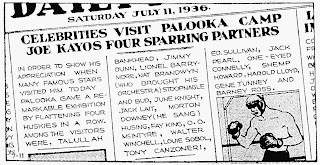 She was one of the celebrities named in the July 11, 1936 Joe Palooka comic strip (below). She has not been found in the 1940 census. Battling Nelson passed away February 7, 1954. The Oregonian, February 9, 1954, reported that the funeral expenses were to be paid by King. 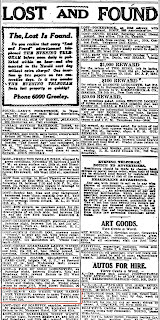 The New York Times, June 27, 1967, wrote about dog owners and the accessories they buy: "…Dog coats of mink, chinchilla and Brazilian jaguar fur are featured in the Bow-Tique (as in bow wow) at Dogs of Distinction, Inc., 1449 First Avenue (near 75th Street) a posh avocado green salon opened this spring by Estyne del Rio, a former dancer, and Fay King, free-lance writer. 'Now here is a coat that is really versatile,' Miss King said recently, picking up a $250 mink dog coat and tossing it around her neck. 'It doubles as a dickey for a woman....' "
An obituary for King has not been found. An essay on King is here. 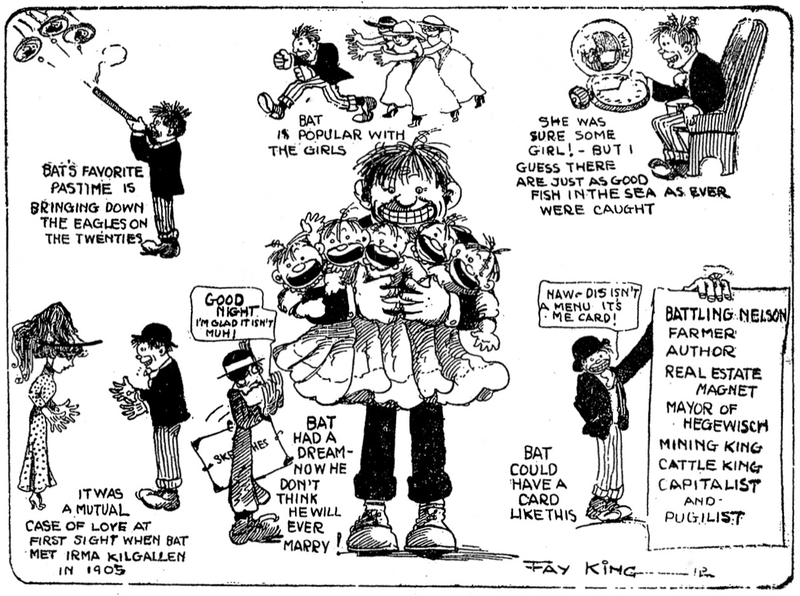 Fay King was never much more than a barely serviceable cartoonist, and I imagine she would have been the first to admit that, but she did seem to know how to endear herself to the newspaper-reading public. 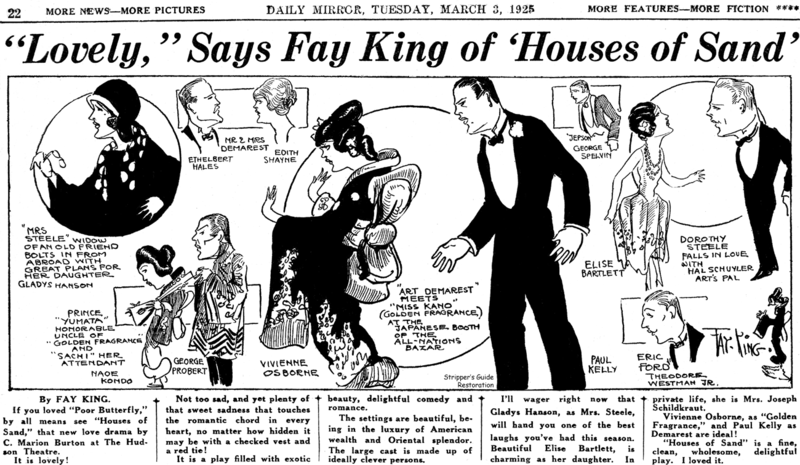 King's personal life had some rather interesting episodes that were gleefully covered in the press (Alex Jay will discuss them tomorrow in an Ink-Slinger Profile) and she produced a popular illustrated column for the Denver Post, then Hearst's New York American and New York Mirror that ran for decades. Strangely enough, though, Fay only tried one actual comic strip series -- it was a daily called Girls will be Girls, and it was a half-baked soap opera concerned a group of attractive flapper-types. It was an unfortunate choice to opt for melodrama as King's cartooning was really suited best to humor, and I find myself waiting for a punchline that never comes in each of these samples. Despite Fay King's popularity, Girls will be Girls seems to have been an utter failure in selling to newspapers. 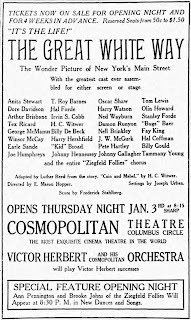 It has only been found (so far) in it's home paper, the New York Mirror, where it ran from June 24 1924 to March 19 1925. A breathless endorsement from the cartoonist herself in Hearst's Circulation magazine doesn't seem to have impressed any editors into buying it. Fay King's strip is one of only two I've ever seen carrying Hearst's Public Press syndicate copyright.I'm afraid I know nothing about the circumstances, business model, or principals involved in this very obscure Hearst syndicate. One thing I do know is that in my book you'll find another strip by Fay King, that one called Mazie. Well, you can get out your Sharpies and put an 'X' through it. Mazie was listed in my book on the strength of a sample and write-up appearing in Robbins and Yronwode's Women and the Comics. 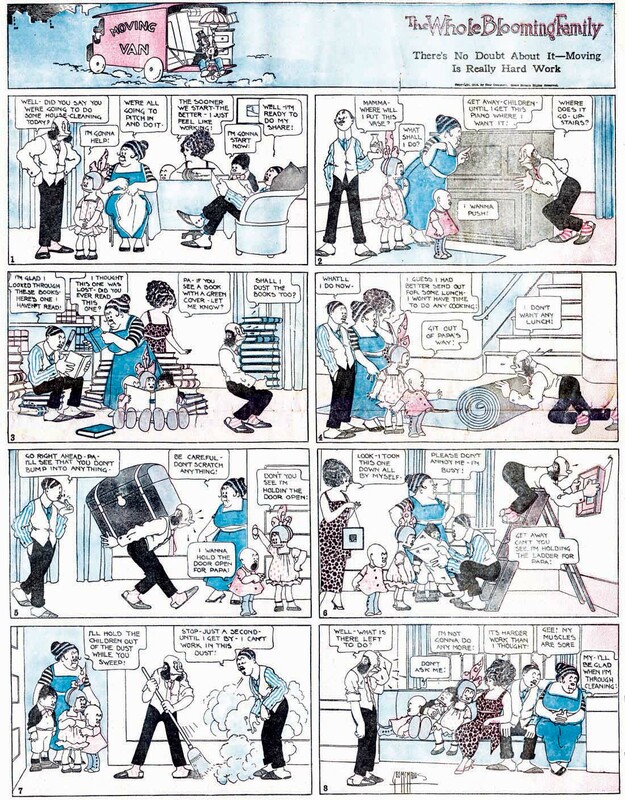 However, I realized in looking at these newly acquired samples above, the Robbins/Yronwode sample shown in the book, and re-reading Fay King's article about the strip, that Mazie and Girls will be Girls are the same strip. Mazie was just the name of the lead flapper in the strip. This strip also appeared in the Uniontown (Penna.) Morning Herald. Thanks for the info Mark. Just goes to show that there's an editor out there for every feature I guess. Any words of wisdom about Hearst's Public Press syndicate? Jim - We will have to come down to help you celebrate your birthday. I'll see if I can gather the gang for a road trip. I better start talking to them now.